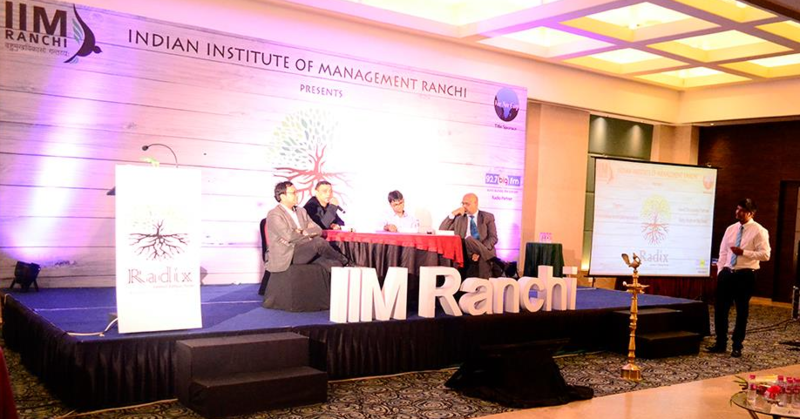 The second day of Radix, IIM Ranchi’s Management Conclave started off with much enthusiasm and positivity at Radisson Blu, Ranchi. The title sponsor of the event was Vee Nee Corporation, an offshore web development company offering a great variety of professional web development services and our radio partner was 92.7 big fm. The theme of this year’s Radix is ‘From Ideas to Implementation’.In today’s world of dynamic business paradigms, an idea is all it takes to change the present and create history. But an idea alone does not suffice. It requires proper nourishment from all stakeholders, it requires ‘implementation’. And most importantly, it needs that pivotal push, breaking inertia and the fear of uncertainty. After a prayer song, Dr. Rohit Kumar, Professor- Strategic Management, IIM Ranchi and the eminent speakers gave a perfect beginning to the event by lighting the lamp. The highlight of the day was an awesome personality who surprised the audience with his excellent humour, his deep intelligence and a plethora of his skills all at the same time. Dr. Sarandeep Singh, Leadership and Start up Consultant, is an MBA from Stanford University and then completed his Ph. D. in Decision Analysis and Risk Analysis from Stanford itself. He has over 18 years of industry experience in firms such as Goldman Sachs, Merrill Lynch and Franklin Covey. He got every student discuss his/her one great idea that will change the whole world with one of their friends to suggest ways to get that idea executed. He told about the 3 principles which govern 90% of decisions of our life- fear, envy and greed whereas those few people who actually succeed in their life are actually governed by courage, focus on their own life and consistency. He encouraged the audience not to concentrate on “WHY AND DON’T” but on “WHY NOT”. The secret success is hidden in the “WHY NOT”. His speech got a perfect ending with his one sentence “LOSE FASTER TO WIN FASTER”. This was followed by a huge and a long round of applause. The other speakers included Mr. Amit Choudhary, Senior Vice President- Corporate Finance, Snapdeal who spoke about raising the bar and beating the new benchmarks. He said, “A good idea is worth 10%, hard work and execution are the balance 90%.” His idea was “People First, Business Later. Business First, Function Later.” His amazing speech was followed by the speech of Mr. Vivek Mehta, Independent Consultant. He spoke about the reasons why idea fails: sometimes the timing is wrong, and maybe sometimes the management is wrong. He quoted Friendster for example which did not succeed as the timing was wrong whereas Facebook was a big hit as the timing was appropriate. He focused on the importance of an idea having a concrete plan and structure and creator of the idea having a positive attitude. He said, “One quality that breeds success is positive attitude, then even the smallest idea becomes implementable.” The last and the youngest speaker of the business conclave of IIM Ranchi was Mr. Meesum Kazmi, Director, Analytics Advisory, PwC. He kicked off the post lunch session by demystifying the journey from strategy to execution. According to him, strategies fail due to lack of unrealistic goals or lack of focus and resources. After these awe-inspiring speeches, a panel discussion among the speakers took place on the topic- “Baby Steps, Giant Leaps” moderated by Dr. Rohit Kumar. All the speakers conveyed their different thoughts about the topic in a very enthusiastic way to the students. Mr. Amit said that the decision to take either big steps or giant leaps depends on the situation. It is a function of age and the experience profile: at early age, there is no cost of failure. Mr. Sarandeep conveyed the idea that neither baby steps nor big leaps matter. He said, “If you have a great idea, sleep over it, ask how ready you are and look for opportunities to leverage it.” Whereas Mr. Meesum preferred baby steps over giant leaps as it happens a lot of times that one has great thoughts and great ideas but they are of no use if not put into action. “The decision depends on the life cycle of the industry you are in”, told Mr. Vivek. It was an enthralling experience for the management students to learn face-to-face from these amazing industry stalwarts. The panel discussion was followed by the celebration of Matra Bhasha Divas. The first year PGDM students of IIM Ranchi gave a presentation about their own Matra Bhasha. The importance of the beautiful languages of India- Bengali, Assamese, Malayalam, Punjabi and Telugu was conveyed by Sharmi, Sanjib, Jitin, Navneet and Yamini. After such a knowledge enhancing experience, the second and the last day of the event ended with a vote of thanks to all our speakers by Mr. Saketh, President, Student Council of IIM Ranchi.